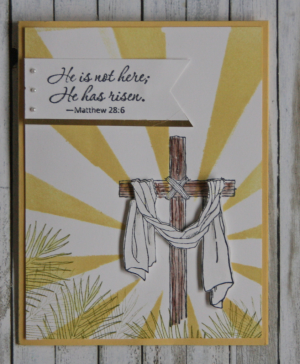 Thought I'd share a quick card that we did for class recently using the Easter Messages. I shared the tutorial in my newsletter this morning so make sure you are on my mailing list to get tutorials such as this. I used the brayer and a windwo sheet to get this stunning look. I ran the Window Sheet through the Big Shot using the Sunburst thinlet die. This card was one of the favorites of the stampers back in my March Brayer class. Enjoy on this Easter Weekend. Note: if you wish to recreate this card for NEXT year, this die is on the retiring list…at a 40% discount so don't delay. It's while supplies last.